Can reading these books make you happier and healthier? How to be the "Cool Aunt"
Here's why Lego blocks just got even more awesome. And finally, my kids and I have been whipping up all kinds of yummy variations of this homemade ice cream recipe from Kim McCosker. Her 4-ingredient/4-minute recipe couldn't get any easier. Wishing you a safe and festive holiday weekend! P.S. Last weekend to sign up! My online photography course starts this Monday, July 6, 2015. It's already a wonderful group of students from around the world--join us and sharpen your photography skills! 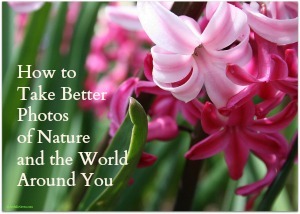 More details and registration here: How to Take Better Photos of Nature and the World Around You.